The report for Day 4 of our Homework Residency has arrived with photos and notes from the residents themselves. Be sure to check out more on our Artists-in-Residence. This post marks the final instalment of documentation from our residency — at least in this form. There’s more ahead that you can anticipate from the Homework publication, videos of the conference presentations, and somehow, more. We’d like to again sincerely thank everyone who made Homework possible and for all the artists in residence for participating. Now without further adieu, here’s some reflections on the final day of the residency, which would be followed by Day 1 of our conference. It’s a week later than we had hoped to be making this kind of wrap-up post, but we also know this is just the beginning of a larger conversation that will span far beyond this space. 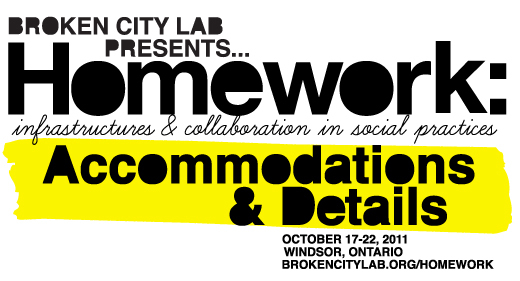 Homework: Infrastructures & Collaboration in Social Practices hosted over 120 artists, writers, community activators, curators, thinkers, and doers from big and small places across North America (and, incredibly, at least one person from overseas). From the first day of the residency to the last day of the conference, the schedule was beyond jam-packed, but the things we discussed, together, made the two-day conference an incredibly rewarding experience for us. We are exceptionally happy with how Homework turned out and we can’t thank you enough for attending and supporting it. There’s still more ahead though — the publication will be assembled over the coming months, and if you’re still looking to contribute, you should get in touch. There’s also been some questions about another edition of Homework, and we’re considering it. We’d love to see these kinds of conversations given a bit more time and space to unfold. We’re also working on cataloguing all the video documentation and we’ll be working to make these video archives available as soon as we can, stay tuned. And, if you have any documentation of the residency or conference, please pass it along. And finally, we’d like to extend our most sincerest thanks to everyone who participated and attended Homework, including our conference panelists and our incredible keynotes! Thank you! Day 3’s report of our Homework Residency comes courtesy of the residents themselves!!! Be sure to check out more on our Artists-in-Residence. Its overwhelming to try and write a blog post about what’s happening… it’s messy to try and recount exactly how things unfold and I mostly don’t remember… There are reflections to be made about the projects we are setting up for ourselves and of course the different decision making models we are using. I feel fine discussing the projects but mostly forget how we arrive at any specific decision. Here are some brief notes Rodrigo, Megan, and I put together this afternoon, with some feedback from Leah tonight. Also, here are some photos from Leah’s, Andrea’s, and my own camera. So, the report on Day 2 of our Homework Residency is going to be delayed, as we’re still gathering documentation. But, this picture seemed like a good start to introducing the day. More to come, soon. Updated: there’s lots of photos that attempt to document the day, but it’s impossible to chart together a narrative to cover it all. In the meantime, you can check out more on our Artists-in-Residence. Get acquainted with everyone here! Looking for a ride into Windsor from some other major city centre for Homework: Infrastructures & Collaboration in Social Practices? There’s been a number of Homework presenters and attendees hoping to carpool down to Windsor, so hopefully we can help facilitate. If you have room in your car, or you need a seat in a car, please make a note in the comments. Everything kicks off on Friday, October 21st at 9am at the Art Gallery of Windsor with Day 1 wrapping up with the keynote presentation starting at 7pm. The conference continues for a second day, Saturday, October 22 from 12pm-5pm at the Art Gallery of Windsor. And, as a reminder, if you can’t make it at all, we’ll be livestreaming as much as we can! Looking forward to meeting everyone heading down. After a long wait, we’re very excited to announce the (working) schedule for our upcoming conference, Homework: Infrastructures & Collaboration in Social Practices! We’ll be updating this page with information regarding the venues shortly. with Justin A. Langlois, Research Director, Broken City Lab. Unpacking the artist’s role in education and beyond educational institutions, what art education does and could look like, the changing roles of student and educator, and the dissemination of knowledge through creative praxis. Examining resistance through collaboration, models for processes and participation, collaborative possibilities across disciplines, and collaborations with communities. Looking at existing infrastructures accidentally and intentionally support alternative practices, borders creating opportunities and crises, role of artist-run centres as a counter infrastructures, and the motives for working creatively between infrastructures. Unfolding spatial pockets of everyday life, the in-betweeness of cities and engagement, uses and misuses of public spaces, the ways in which we understand place, and open-ended landscapes. 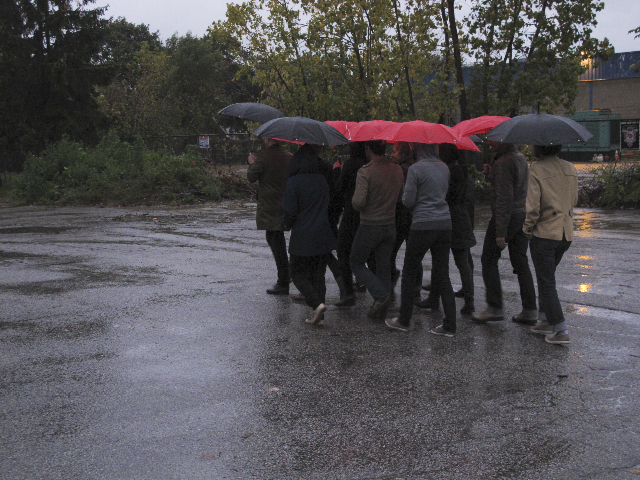 Featuring all Homework artists-in-residence discussing their work together over the course of the four-day residency. More details are available on our Keynote Page. 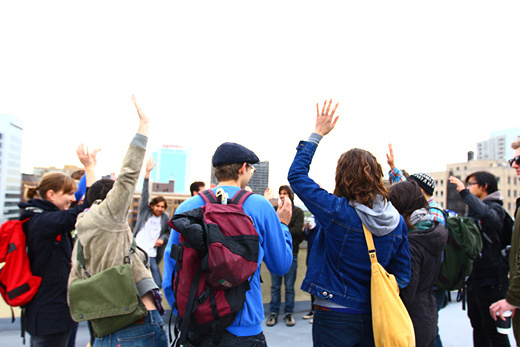 The Revolting Dance Party is an ongoing project, based on Group Material’s project of the same name, that engages with music that is focused on social and political issues. Amber Landgraff DJs the event using songs shared on sites like Youtube in order to bring social media as an act of activism back from the imaginary space of the Internet and into a physical community space. Homework is a four-day residency, two-day conference, and collaboratively written publication, and as such, we will utilize the morning of Day 2 to start generating content for our book, together. Details about times and locations to participate in this process will be forthcoming. However, as you already know, simply by attending, you have the opportunity to participate in the creation of this book. More soon. How do we support or invent the practices that are needed to respond to the economic, social, and political realities of today? How might we find solutions, inspirations, and models for a way forward through new schools, new byproducts, new practices, and new infrastructures, leading us toward a critical and novel way of integrating art with everyday life. Practices that embed themselves in existing infrastructures. Practices that invent infrastructures and infrastructural services. Practices that collectivize against and alongside new, old, and unimagined infrastructures. We have secured a group rate for anyone attending Homework to stay at one of three hotels in Windsor’s downtown core. 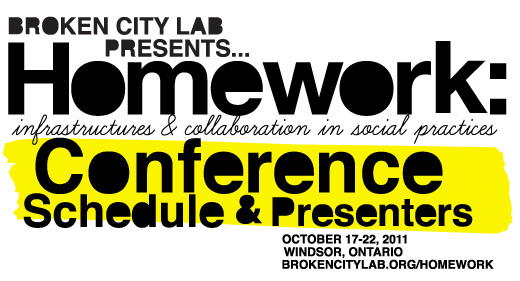 If you book the room, please note that you would like the Broken City Lab Homework Conference rate. This group rate is only valid until September 19th, 2011. Hilton Windsor: $115 per room, per night, $11 self parking per car, per night or $21 valet parking per car, per night. Windsor Riverside Inn (formerly the Radisson): $105 per room, per night, $10 self parking per car, per night. 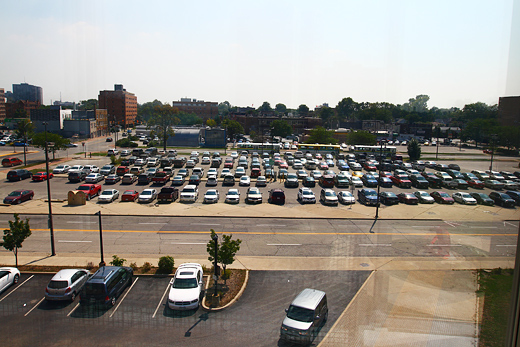 Travelodge Hotel: $89 per room, per night, $10 self parking per car, per night. Homework: Infrastructures & Collaboration in Social Practices is just two months away and we’ll be announcing a lot of information around the conference schedule and activities in the coming weeks. First though, we wanted to post some information for those of you traveling from out of town. The conference panel discussion schedule will be detailed in forthcoming posts, but as an overview: Day 1, October 21, will be made up of panel discussions from selected participants, and Day 2, October 22, will be a series of group discussions led by our Keynotes. 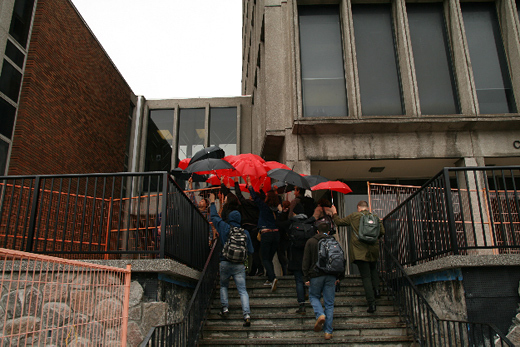 The conference will be held on the University of Windsor’s main campus for both days of the conference. Once we finalize our space reservation, we will send out another email noting the exact location. Please check-in between 8:30am and 9:30am on Friday, October 21st. The conference will begin at 10am sharp. Information on your project to share with other conference goers, your passport (if you want to travel to Detroit), and a sense of curiosity. Also, feel free to bring cameras, audio, and video recorders to document the conference — we may want to include these on our website and in the pages of our Homework publication. -Windsor does have an airport, so you can fly into Windsor directly. -From anywhere in Canada you can also take to Via Rail, or Greyhound bus service to Windsor. You can get around town by car, bicycle, or bus. If you want to cross the border, you will need your passport. There is a tunnel bus that departs from Transit Windsor’s downtown terminal that’s quite convenient if you need / want to cross the border. 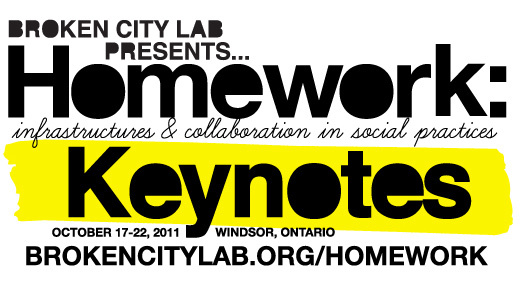 We are very pleased to announce our Keynote Speakers for Homework: Infrastructures & Collaboration in Social Practices! Gregory Sholette, Marisa Jahn, and Temporary Services (represented by Salem Collo-Julin) will join us on October 21 and 22, 2011 to deliver a keynote panel and round-table discussions. There’s still time to register — and it’s free! Gregory Sholette is a New York-based artist, writer, and founding member of Political Art Documentation/Distribution (PAD/D: 1980-1988), and REPOhistory (1989-2000). 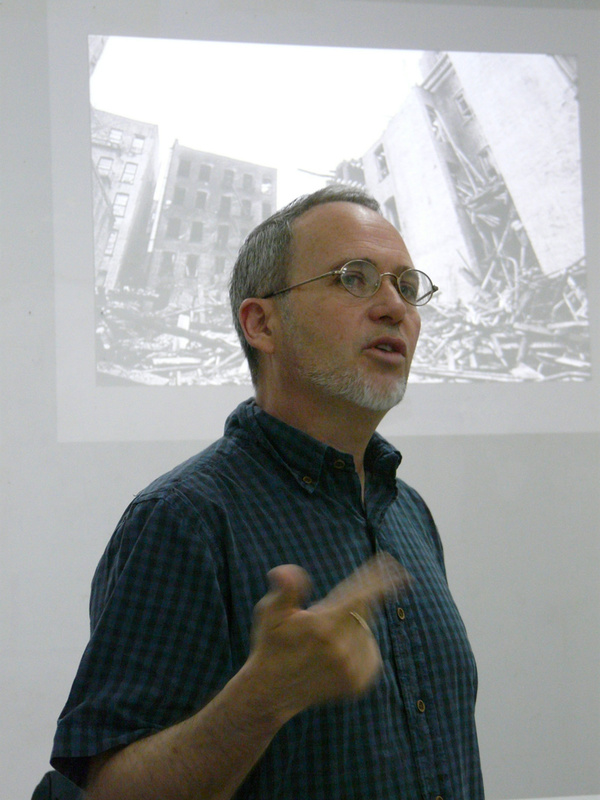 A graduate of The Cooper Union (BFA 1979), The University of California, San Diego (MFA 1995), and the Whitney Independent Studies Program in Critical Theory, his recent publications include Dark Matter: Art and Politics in an Age of Enterprise Culture (Pluto Press, 2011); Collectivism After Modernism: The Art of Social Imagination after 1945 (with Blake Stimson for University of Minnesota, 2007); and The Interventionists: A Users Manual for the Creative Disruption of Everyday Life (with Nato Thompson for MassMoCA/MIT Press, 2004, 2006, 2008), as well as a special issue of the journal Third Text co-edited with theorist Gene Ray on the theme “Whither Tactical Media.” Sholette recently completed the installation “Mole Light: God is Truth, Light his Shadow” for Plato’s Cave, Brooklyn, New York, and the collaborative project Imaginary Archive at Enjoy Public Art Gallery in Wellington New Zealand, and is currently working on an installation for the Queens Museum of Art, and the Tulca Arts Festival in Galway, Ireland. He is an Assistant Professor of Sculpture at Queens College: City University of New York (CUNY), has taught classes at Harvard, The Cooper Union, and Colgate University, and teaches an annual seminar in theory and social practice for the CCC post-graduate research program at Geneva University of Art and Design. 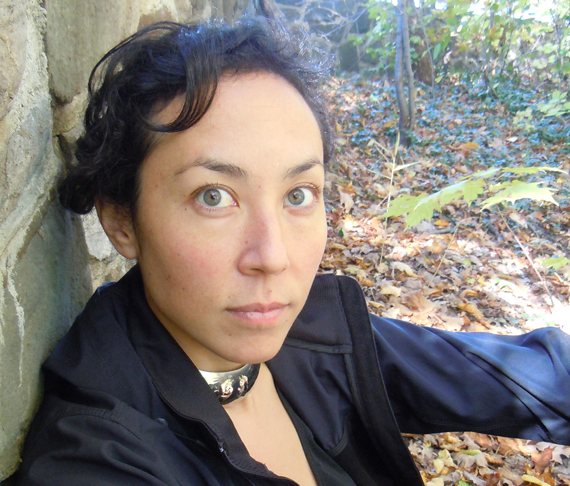 The editor of “Byproduct: On the Excess of Embedded Art Practices,”, Marisa Jahn is an artist, writer, and community organizer embedded in various social and economic justice groups since 2008. Her work has been presented at venues such as the MIT Museum, The Power Plant (Toronto), ICA Philadelphia, The National Fine Art Museum of Taiwan, New Museum (NYC), ISEA, the San Francisco Museum of Modern Art, the Boston Museum of Science, and more. A graduate of MIT and an artist in residence at MIT’s Media Lab, Jahn has been recognized as a leading educator by UNESCO and has been a CEC Artslink cultural fellow in Tajikistan, Estonia, and Russia. Her work has been written about in media such as The Wall Street Journal, Los Angeles Times, New York Times, Clamor, Punk Planet, Art in America, and Discovery Channel. 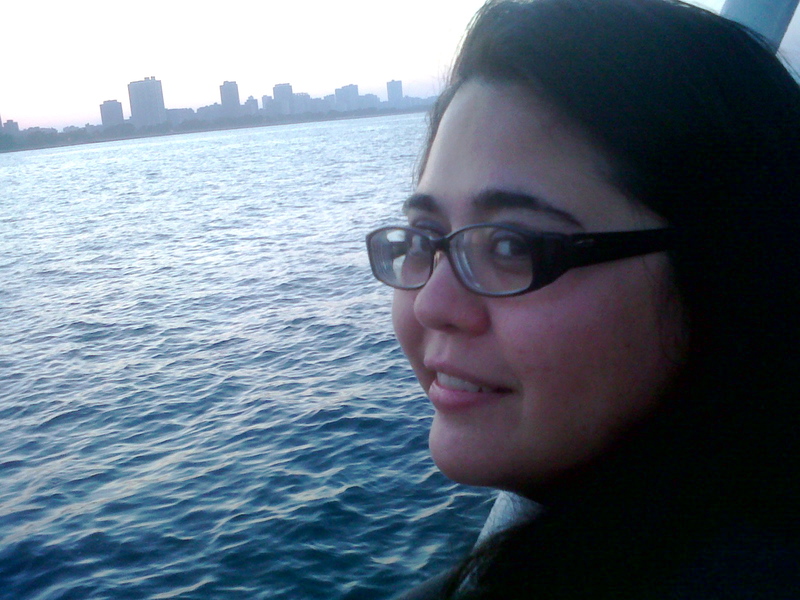 In 2009, she co-founded REV-, an organization dedicated to socially-engaged art, design, and pedagogy; she is currently the Deputy Director at People’s Production House, a journalism training and production institute that works with low-wage workers, immigrants, and teens to produce groundbreaking news that has been seen and heard on BBC, ABC, PBS Newshour, Mother Jones, The Nation Magazine, The New York Times, and more. Temporary Services is a group of three people: Brett Bloom (based in Copenhagen), Marc Fischer (based in Chicago), and Salem Collo-Julin (based in Philadelphia). They collaborate on producing projects, publications, events, and exhibitions. Making a distinction between art practice and other creative human endeavors is irrelevant to Temporary Services. 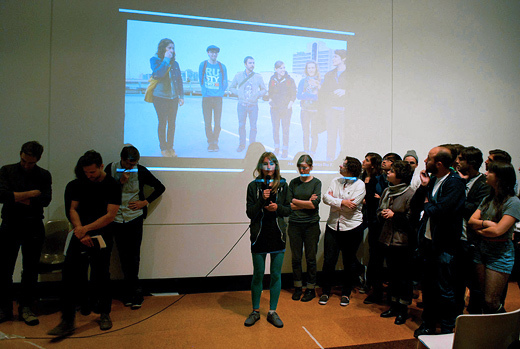 The group started as a storefront arts and events space in a working class neighborhood in Chicago in 1998. 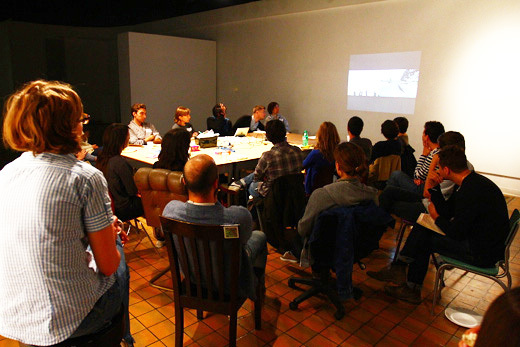 Since then, Temporary Services has been responsible for the publication of over 91 books and booklets (including 2003’s Prisoners’ Inventions and 2008’s Public Phenomena), and have created many projects in public and shared spaces, in spaces often dedicated to art and spaces often used for other things, and on the internet. Most recently, they participated in an exhibition on the Lower East Side organized by Creative Time. The members of Temporary Services founded Half Letter Press in 2008 as a experimental web store and publishing imprint in order to help support themselves and champion the work of others. Salem Collo-Julin is a Chicago native. In addition to her work with Temporary Services, she writes, edits, and performs. She is a co-founder of The Free Store Chicago.